Run on-demand - allows a Workflow to be run by a user from the Console, or via an API. Always On - enables a Workflow to be run continuously until it is explicitly stopped. An Always On Workflow appears like this on the Console. 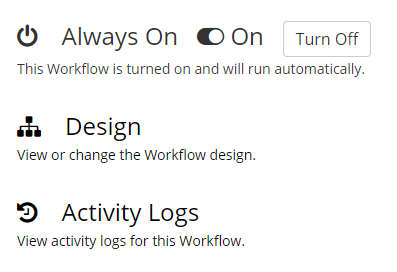 Click on the Workflow Settings cog at the bottom of the Console to access the Workflow Design Settings Pane. If you'd like to run the Workflow as an API (e.g. from a third party app or service), you can configure the Endpoint settings from this screen too.